NASA's Messenger probe has been making discoveries about Mercury since 2011, sharing that knowledge with the world. But its mission will come to an end on Thursday, with the ship expected to crash into the same planet it has so faithfully observed. Traveling at 8,750 miles per hour (3.91 kilometers per second), the spacecraft will meet its fate in a massive impact, bringing an end to its tenure of mapping the solar system's smallest planet in acute detail. The collision is expected to occur at 19:30 GMT Thursday, with Messenger crashing into the far side of Mercury and leaving a 16 meter crater near the planet's north pole. “It’s like losing a member of the family,” mission head Sean Solomon told Scientific American. The impact will take place beyond the view of ground-based telescopes. NASA will only confirm the collision has taken place when Messenger fails to appear hours after the expected crash time. The spacecraft has been running on borrowed time since last winter, when it ran out of propellant. It has been slowly spiraling towards Mercury's surface ever since. This prompted scientists to become creative in order to keep Messenger up and running, developing a makeshift alternative source of fuel from the helium used to maintain pressure inside its gas tanks. It was the first time anyone had tried to extend a spacecraft's life in such a way. But no amount of innovation or ground-breaking technology can save Messenger now. However, despite its impending doom, Messenger's résumé is an impressive one – and its achievements have forever changed the way scientists look at Mercury. Traveling a total of five billion miles through space, Messenger launched from Earth in 2004 and arrived in Mercury’s orbit in 2011. It has long exceeded its original planned one-year orbit. It has captured more than 270,000 photos of Mercury, although its original goal was to snap a mere 2,500 images. Some of those photos have revealed signs of recent volcanic activity. Others have pointed to “hollows” – steep depressions in the planet where approximately the top 10 meters of the surface are missing. The probe has also revealed major discoveries about the planet's make-up. Among those were finding the presence of frozen water – a surprise, considering the planet's proximity to the Sun and its daytime temperatures of 427° Celsius (800° Fahrenheit). It also revealed an unexplained dark layer above the ice, which NASA believes to be carbon-rich compounds. 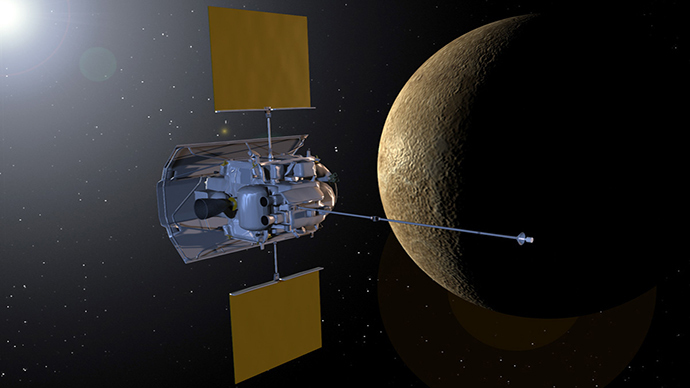 Though scientists must now say goodbye to Messenger, the probe's 'grave' may be spotted and studied in the future by the European/Japanese BepiColombo spacecraft, which is expected to launch in 2017 and arrive at Mercury in 2024.